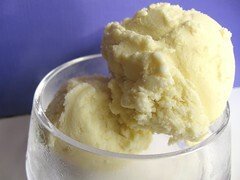 Lavender Ice Cream - Do You Know The Muffin Man? Notes: I saw some organic lavender (from Jacob's Farm) at Whole Foods in Oakville on the weekend and thought I'd try making an ice cream out of it. There are several recipes online, many including orange, lemon or honey, but I wanted to try an ice cream infused with the herb alone. In case anyone's comparing, I didn't mix in heavy cream at the end; instead, I combined table cream, milk and heavy cream together at the beginning. I was also short one egg yolk. The taste is reminiscent of rosemary, pine and cinnamon but more muted.